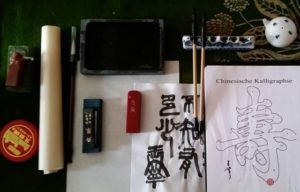 Ning is a Calligrapher, a seal cutter, a translator and a Taijiquan teacher. He studied German literature and linguistics in Beijing and is living in Germany since the end of the 80s. 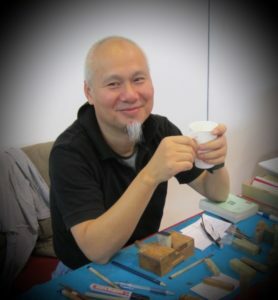 Due to his course of life, he is able to build bridges between Chinese and Western thought and feeling. His introduction into the (philosophical) basis of the Chinese movement arts does not consist of dry theoretical lectures: Ning retraces the concepts, which express themselves in images that are hidden in the characters of Chinese writing. Their interpretation guides us onto a fascinating trail leading through Chinese cultural history. Surprisingly, this approach often unearthes a different meaning than that which is transported in the translations and equivalences commonly used in the occident. Writing material can be purchased directly from Ning at the beginning of the workshop (costs: ). If you will need some, please also indicate on the form so that he can bring enough material with him. If you are already in to calligraphy, do not hesitate to bring your own brushes etc. !